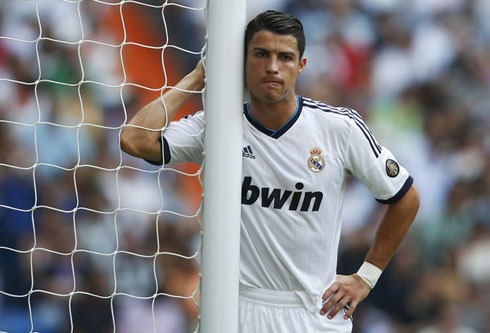 Real Madrid failed to beat Valencia last Sunday night, as they hosted the "Che" side at the Santiago Bernabéu. Higuaín scored the opener early on the first half, but the Brazilian player, Jonas, equalized the match close to the half-time. 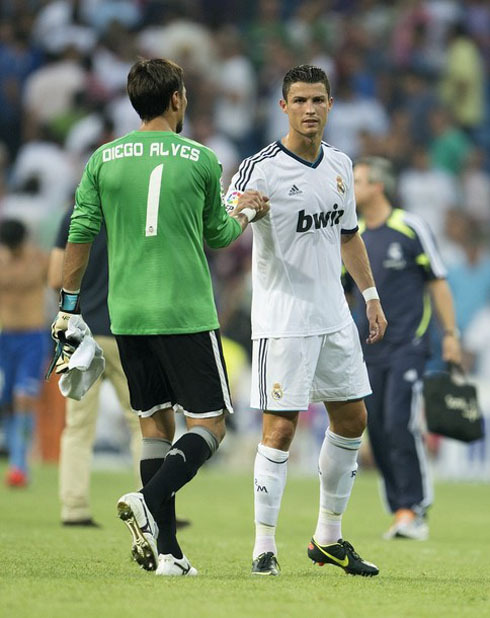 Cristiano Ronaldo didn't have a good performance, just like most of the rest of the "Merengues" players on the pitch. La Liga 2012/2013 has official kicked off for Real Madrid, but the Merengues were held to a home draw against Valencia CF last night. The 1-1 result penalized José Mourinho's men, who never managed to really put Valencia against the ropes throughout most of the match. Gonzalo Higuaín for the Merengues and Jonas for the visitors, were the men adding their names on the scoresheet, while Cristiano Ronaldo had an unusual weak performance, with very few positive actions in the game. The Merengues seemed to be on the right path in this year's La Liga debut, as they reached the lead against Valencia still before the 10th minute of the game. Angel di María assisted Gonzalo Higuaín for a great goalscoring chance inside Valencia's area and the Argentinian forward celebrated Real Madrid's first goal in official games this season, but only after an initial strike and two rebounds. Valencia's defense had a serious marking error and despite a good effort from Diego Alves, who had two good stops, the ball ended up getting in. Both sides showed signs of being far from their best levels as they were struggling to present the crowd with quality combinations and fast team plays. Real Madrid controlled the midfield during most of the game, but the transitions weren't being processed very fast, which allowed Valencia to block the Merengues' intentions at almost every attack. On the 42th minute, Valencia got the equalizer and it all started from a free-kick near Real Madrid's area. The Brazilian attacking midfielder, Jonas, seized a good opportunity that came from a mistake between Casillas and Pepe, as he easily headed the ball to the back of the Merengues' net. Not only Real Madrid conceded a goal that ended being crucial in regard to the fate of the game, but also Pepe and Casillas were harmed in the play, with the Portuguese player being replaced some minutes later, by Raul Albiol. The half-time arrived just a couple minutes after Valencia's goal and even though the 1-1 scenario wasn't exactly a positive one from the Merengues point of view, there were plenty of reasons to think that the second half could have a totally different story. However, Real Madrid failed to impress after the break and missed a few good chances to restore a lead that would surely allow them to start this La Liga season with 3 points. Similarly to most of Real Madrid players on the pitch this Sunday night, Cristiano Ronaldo also had a bad game, as he never managed to be as influential as he usually is. It's now time to put this game behind and start focusing on this Thursday's Clasico, with Real Madrid facing Barcelona for the Spanish Supercup first leg. Real Madrid will now face Barcelona, at the Camp Nou this Thursday night (23th of August, 2012), for the first leg of the Spanish Supercup. You can watch Juventus live stream, Barcelona vs Real Madrid, Barça vs Real Madrid (Español), Everton vs Manchester United and Tottenham vs WBA from our football live streams section.